The big band era was an exciting time in the music industry. Never before or since has music been as dynamic and exciting. However, it was mostly a white man's industry in the 1930s and 1940s. A few of the band leaders were brave enough to hire black artists like Benny Goodman hiring Lionel Hampton and Teddy Wilson or Artie Shaw hiring vocalist Billie Holiday. However, for the most part the big bands were segregated. It was nearly unheard of for a woman to be a part of a band unless she was the vocalist. Band leader Woody Herman broke down that barrier when he hired female Billie Rogers to not only sing for the band but play a mean trumpet. Billie Rogers was born on May 31, 1917 North Plains, Oregon. She was a member of the trumpet section and featured soloist with Woody Herman from 1941 to 1943. 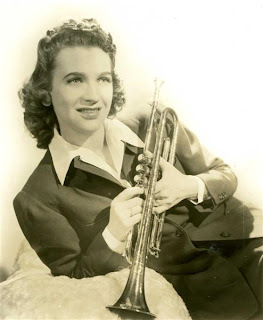 She led her own band in 1943, then at the end of that year, joined the Jerry Wald band and remained a member until October 1945, when she left to form her own sextet. Rogers is credited as being the first woman to hold a horn position in a major jazz orchestra. Woody Herman discovered Rogers in August 1941. After his band had finished for the evening at the Palladium Ballroom Cafe in Hollywood, Herman had gone to a small Los Angeles night club where Rogers was singing and playing trumpet. Impressed, he asked for an introduction. Sammy Cahn, the songwriter, did the honors and, within a few minutes, Herman hired her to be a member of his "Blues on Parade" band. She made her debut with Woody's band at the Panther Room of Chicago's Sherman Hotel. Rogers grew up in Washington state, then in Missoula, Montana. She was raised in a family of musicians. Her father, William Cody Smith (1885–1970), played banjo. Her mother, Bertha Emde (née Fleming; 1892–1976), played seventeen instruments, proficiently – predominantly ragtime piano and accordion. Her older brother and mentor, Lester Smith (1913–1936), was proficient on many instruments. According to Billie, his sudden death affected her for years to come. Her younger brother, Kenneth Gaylord Smith (1920–2005), played sax. She also had a younger sister, Alice V. (Mrs. Olaf Hemnes; 1924–1996). And, she played in vaudeville and theater bands. Billie is reputed to have perfect pitch. Rogers studied music at the University of Montana. Rogers met Jack Archer (1909-1962) while performing with Woody Herman. She and Jack married on April 21, 1944, in Chicago. Jack built a career as a booking agent, initially for big bands in the one-nighter category, but in the 1950s while with Shaw Artists, he moved into promoting R&B - which was a new genre of music at the time. When Rogers met Jack, he had recently received an honorable discharge from the U.S. Army (1943) and, that same year, had become the road manager of the Woody Herman Orchestra. 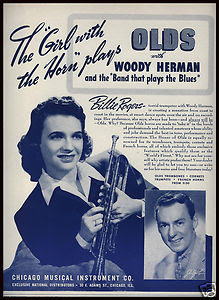 Billie left the Herman band on October 27, 1943, to form her own band. Jack, who at that time was engaged to marry Billie, also left Herman to manage her band, which he did from July 22, 1944 until the end of 1944, when the group disbanded. Overlapping with his responsibilities managing the Billie Rogers Orchestra, Archer was handing bookings for Mills Music, staying on until January 8, 1944, when he then became head of the one-night band department at General Amusement Corporation, a position he held until July 22, 1944. Thanks for this terrific article on Billie Rogers. Great article! I'm a female trumpet player myself, and had never heard of Billie. What a treat! I love the Olds trumpet ad photo as well. I wonder what model she played? They're beautiful horns and still pretty coveted for jazz playing today. Thank you so much for this article. Billie was my great aunt, an incredible woman with a wonderful sense of humor and sharp as a tack even at age 96. It saddens me to share the news that Billie passed away over the weekend. I am uploading some recordings I have of Billie to You Tube. Just type in her name and there will be some there. She was the best! David - thanks so much for writing this terrific bio on my mother, Billie. I would mention that dad went to work (most notably) for Shaw Artists after mom's band days ended - and that is where he was agent to many of the major jazz musicians of the day and near-all the early rock 'n' rollers. Thanks again! Hi! I think we were in touch briefly when your Mom died. I was so honored and amazed that she emailed me when she was in her 90s. I am uploaded some material I found of her own band. I'm sure you have it it. I wish I would have gotten to know her more!